But there’s nothing stopping the leaves from their natural progression. It gets cold here at night, which causes those leaves to do what they do this time of year. There are pops of orange and yellow among the palm trees and redwoods, reminding us all in Northern California that it can’t be gorgeous all year round. It also reminded me of a few seasonal Impressionist paintings and was inspired to do a fun art activity with the tot that would also help hone her budding fine motor skills and interest in keeping things within the lines. Such a great scene, right?! But, back to the fall project. Get out a sheet of white paper and invite you child to draw a tree with a brown marker — just the trunk. If you’ve got a tot like I do, go ahead and help out by drawing the tree. It doesn’t have to be perfect, just go with it. Squeeze out a small drops of red, yellow, and orange paint onto a sheet of scrap paper. Place a few cotton swabs next to the paints and encourage your tot to dip the top of a cotton swab into one color of paint and then dot around the tree to create dabs of color just like Georges Seurat. Now your child can keep making more dots with another cotton swab dipped in the other autumn colors creating a fall tree full of small dotted leaves. 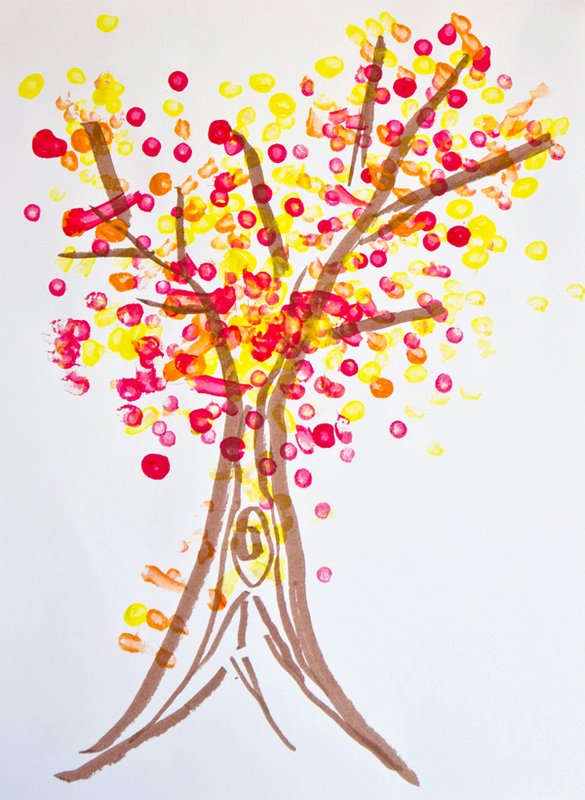 Older kids can create tightly organized collections of dots around each branch of the tree while younger tots can enjoy the fun of popping colors all over the paper. 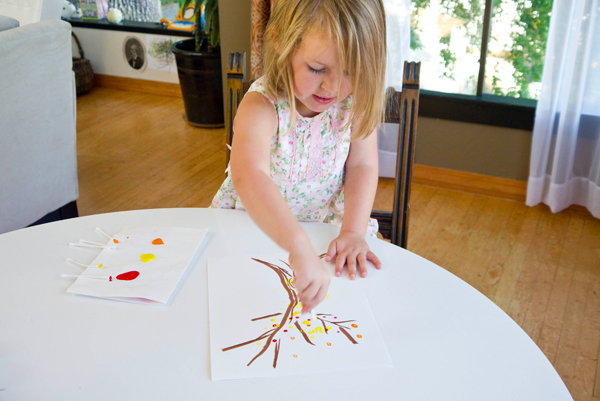 After your child is satisfied with her fall pointillism tree, find a place to display it for the rest of the family to enjoy. Don’t forget to check out how the artwork looks close up compared to from a distance! I love this and have featured it on The Sunday Showcase this week.